OK, WHAT'S IT ALL MEAN? Let's go through your site audit item by item! Important: The illustrations shown below are not your site, but rather samples to help you follow along! If you haven’t yet ordered your free SEO Audit, you can do so right here. Your page grade is based on a number of factors shown in the report and as you correct each of the issues, your page’s score will climb. But of course, what matters most is where your site ranks in the search engines. The search engines are said to consider more than 200 factors when determining where a web page will rank. The information presented in this audit covers many of the most important factors. It gets a bit complex, but stay with me! Page loading speed has quickly become one of the more important ranking factors because more than half of all search queries are made on a mobile device. The search engines reward pages that load quickly, ideally in one second or less. Photos are almost always the worst offenders because a lot of people have uploaded images that are much larger (in kilobytes) than needed for use on the internet. If your images weigh in above 300KB, you should consider reducing their size and re-uploading them. In the early days of SEO optimization, having your primary keyword phrase included your the site’s URL was all the rage. And it worked… for a time. The search engines quickly caught on reduced the “weight” they gave to exact-match URLs. Debate persists about whether or not they are helpful to a site’s ranking; my opinion is that there are many other factors one should work on improving on their site. That said, if you’ve done everything else you could to improve your rankings, and you’re still not where you want to be, then perhaps consider changing your site’s domain name. The TITLE meta tag is an important ranking factor. It’s also what usually shows in blue as the ‘title’ of the listing. Ideally, you’ll want to have no more than about eight words and the title should contain a keyword phrase relevant to the page contents. You’ll also want to have the keyword phrase near the beginning of the TITLE tag. The DESCRIPTION tag contains one or two sentences that describe what the web page contains. Although the DESCRIPTION has been reduced in importance in terms of your site’s ranking, it remains important because it is usually shown below the TITLE of the site in the SERPs (Search Engine Results Pages). As you may have guessed, a well written DESCRIPTION can dramatically increase your conversion rate because it will entice potential visitors to click on your listing. The most-used words should correlate closely with your keyword phrases, have look at the bar chart and adjust the copy on your page if needed. 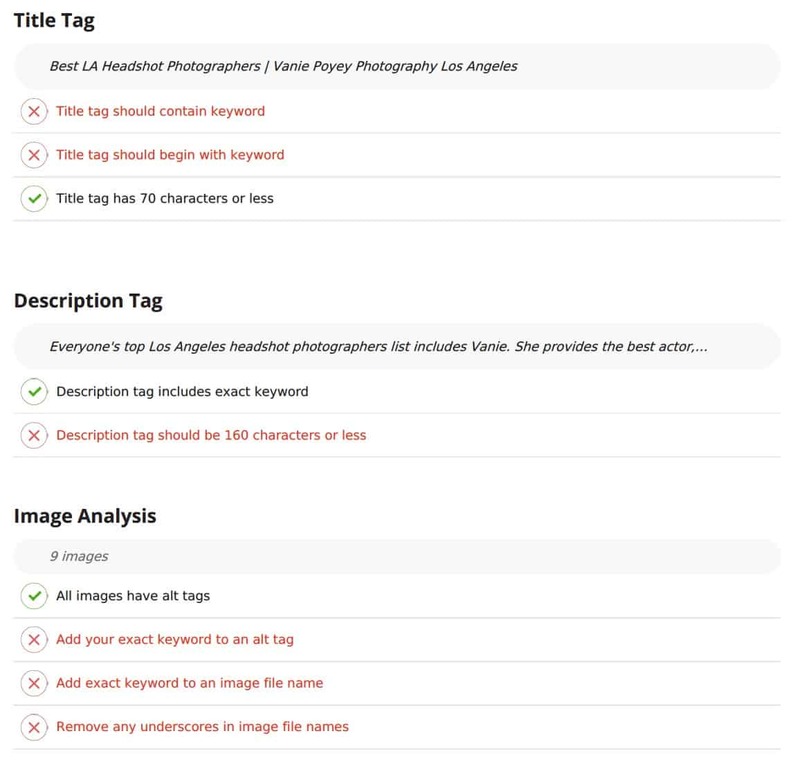 Heading tags are critically important for SEO. 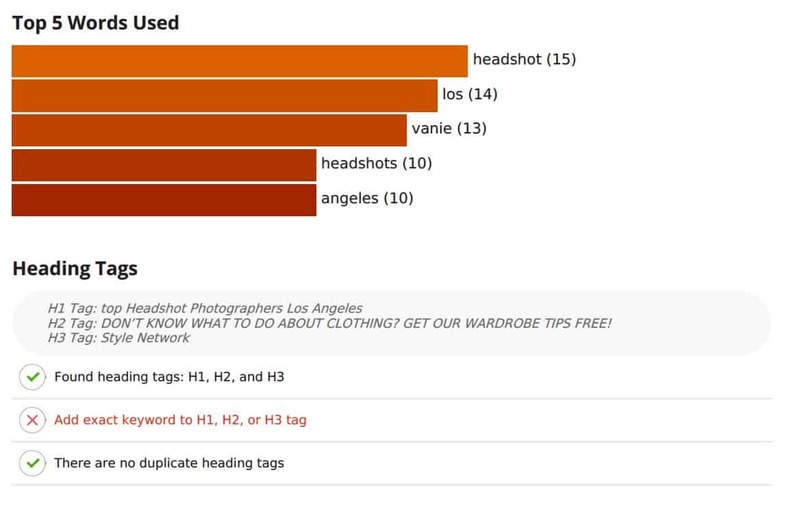 H1, H2, and H3 tags should be utilized and should contain your keyword phrase where possible. Take care not to over do it, overuse of these tags is not recommended. This section deals with a very import aspect of your site’s optimization, the human-readable copy on your home page and the site’s incoming links. Search engines love text; after all, they can’t “see” pictures, so they rely on copy on the page to determine what your website is all about. The “Copy Analysis” displays some important factors you should work to improve on your page. 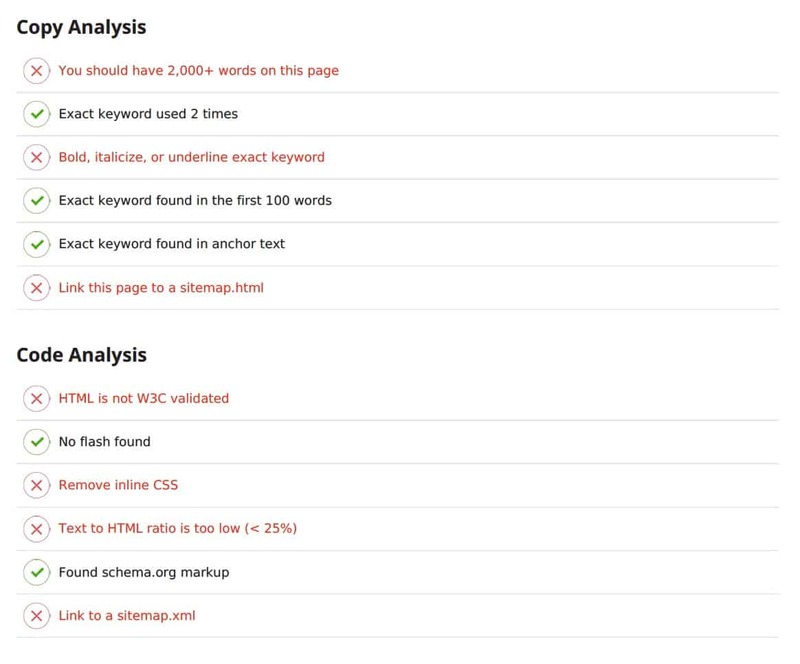 Next, the “Code Analysis” section contains valuable technical information about your page. Important items here include W3C validation, text to HTML ratio, and whether or not the page is included in your sitemap.xml file. Probably by now you site doesn’t contain any Flash content. If it does, remove it promptly; Flash is outdated and this content dramatically slows the loading time of your page. If your site has a specially formatted version designed for mobile devices, it is strongly recommended to create a separate mobile sitemap and submit it to search engines. That will allow search engines to better serve search requests from mobile devices and lead them to your website pages. 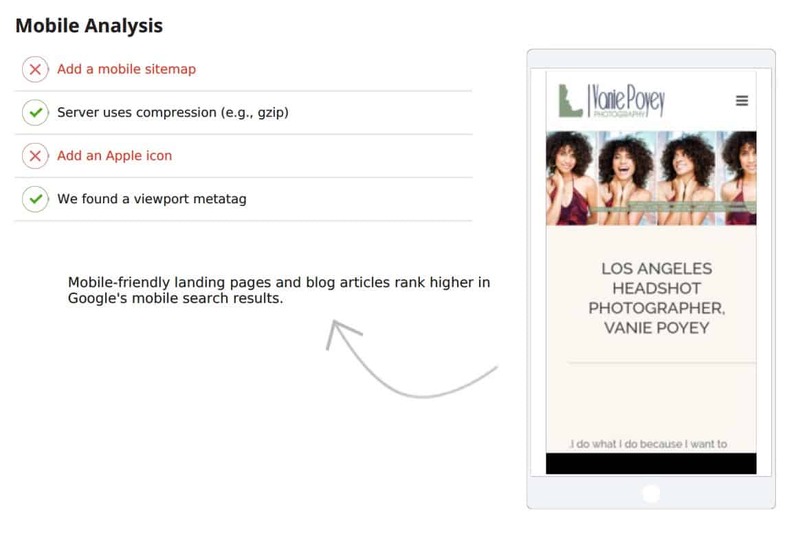 Mobile sitemaps should only contain links to pages with mobile web content, otherwise your regular xml sitemap can be used. Your site should be utilizing GZIP compression for improved load times on mobile devices. Also, for mobile devices, a viewport metatag lets the server know what the resolution of the visitor’s device is and scales the content accordingly. Most SEO experts feel that relevant incoming links from other reputable websites are one of the most important factors in determining where a website will rank. Generally speaking, the more incoming links your site has, the better it will rank. MozTrust is SEOmoz’s global link trust score. 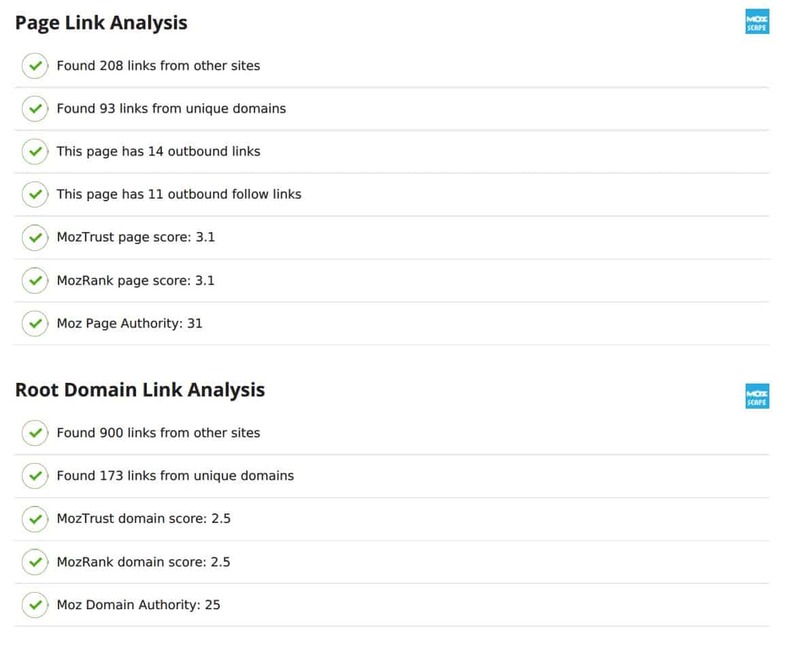 It is similar to MozRank but rather than measuring link popularity, it measures link trust. Receiving links from sources which have inherent trust, such as the homepages of major university websites or certain governmental web pages, is a strong trust endorsement. MozRank is a popularity score of any website which is updated regularly and given number from zero to 10. A MozRank of 3 or higher is considered good for most sites. Moz Domain Authority is a search engine ranking score developed by Moz that predicts how well a website will rank on search engine result pages (SERPs). 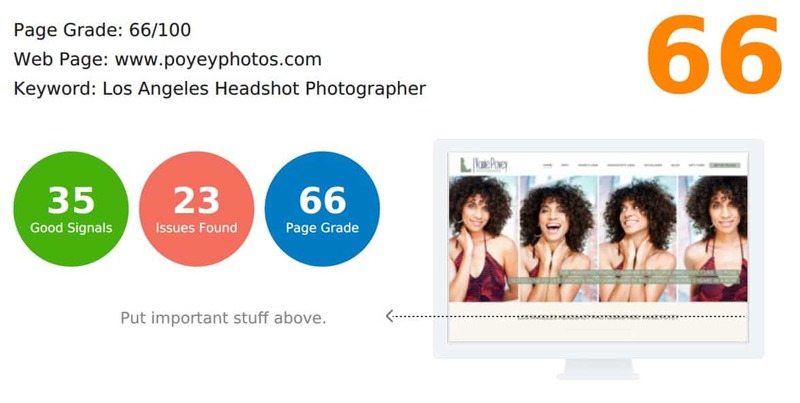 A Domain Authority score ranges from one to 100, with higher scores corresponding to a greater ability to rank. One of the easiest actions you can take immediately is to extend the expiration date of your website’s domain. The search engines consider the age of the domain and how far forward it is registered when ranking a site. 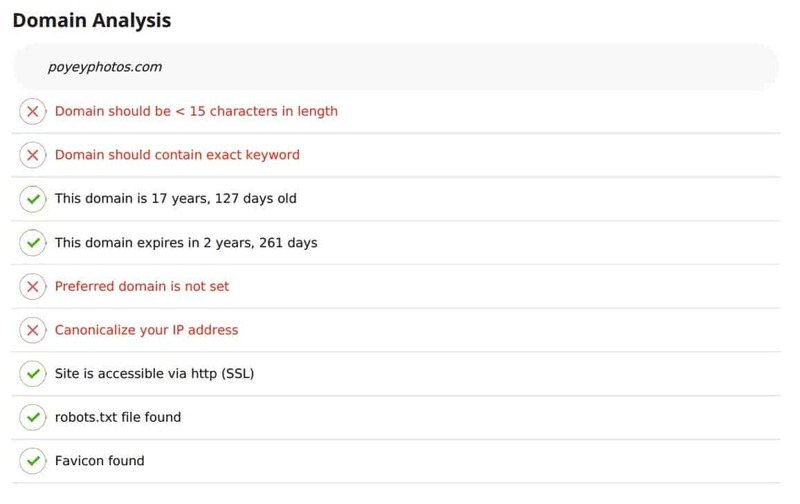 A very important ranking factor is whether or not your site loads securely. This is indicated in most browsers by the presence of a green lock in the browser’s URL bar after your site loads. It’s so important that Google’s Chrome browser now presents a full page warning to the visitor advising them not to visit the site. The presence of a favicon is best-practices for any website nowadays, as is a robots.txt file. If they’re missing from your site, be sure to get both in place. ready to discuss your website with us? We look forward to talking with you to discuss the options available to increase your site’s ranking and ultimately increae revenue for your business.